Split cord malformations (SCM) are a form of spinal dysraphism in which the spinal cord itself is split into two hemicords. In type 1 SCM, the two hemicords are contained within two separate dural sleeves, often separated by a bony or cartilaginous septum. In type 2 SCM, both hemicords are contained within the same dural sleeve. This chapter discusses the anatomy and classification of SCM, including a discussion of the cutaneous abnormalities associated with SCM and the other dysraphisms that may accompany SCM. In addition, there is a review of the theory of embryologic insult that leads to SCM formation. Finally, the chapter discusses the natural history, details of surgical treatment, and outcomes from surgical treatment. 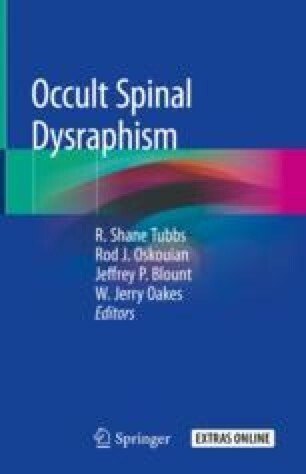 The natural history of SCM is thought to be unfavorable, with progressive neurological deficits. Surgical treatment strategies should focus on complete release of all tethering elements. The online version of this chapter ( https://doi.org/10.1007/978-3-030-10994-3_12) contains supplementary material, which is available to authorized users. The untethering of a type 1 split cord malformation. AANS Neurosurgeon Neurosurg Subspecialization. 2016;25(4). In the Loupe. http://aansneurosurgeon.org/multimedia/?mm_id=5109#nav-primary.